Marvel is proud to present your first look at Spider-Men #2, by the chart-topping creative team of writer Brian Michael Bendis and artist Sara Pichelli! When Peter Parker is thrown into Miles Morales’ world, the duo begin a journey that will not only answer questions about their own identities, but also reveal the truth about a major character in the world of Spider-Man! Kick off Spider-Man’s 50th anniversary in style with double the web-slinging action in Spider-Men #2, hitting comic shops, the Marvel Comics app and the Marvel Digital Comics Shop this June. Miles and Peter Square off on the roofs before Mile’s knocks him unconscious and takes him to Nick Fury. They then travel by hellicopter while Miles tells Peter what happened to his counterpart on this earth. They get attacked by Mysterio’s avatar! Cover-The shattering effect highlights the coming together of these two very different Spider-men in a dramatic way, they literally crash into each other. The alternate has both Peter and Miles pulling off each others masks, it’s a bit sparse by comparison but still looks great. Miles Morales-I love this kid! This issue had more Miles and was all the better for it! Miles proves very resourceful in battle and even did a few things we’ve never seen before. That huge jolt of venom destroyed Peter’s web and knocked him out after using the webbing itself to transport the sting from miles hand to him, very cool! The use of his agility and camouflage were also very commendable and proves that he could be the “beast” in battle I’ve always thought. Villain- Mysterio’s been a former favorite from back in the 90’s and his tussle with X-men/Nate Grey made me wish he could become a threat beyond just “spider baddie” that never panned out but it was great seeing him this issue take charge of the situation and go after both Peter and Miles in a decisive way, Miles has never faced anyone like this yet so this should be entertaining! Art- Sarah Pichelli you are my artist of 2012, round of applause for this very talented lady! Action- Miles Morales vs Peter Parker was very well choreographed and executed, for that fight alone this issue is worth a purchase! Spider Men- Miles and Peter play off each other excellently. Bendis illustrates the “awe” of Miles in this Older Peter’s presence like the pro he is. I couldn’t help but smile just listening to Miles drool over Peter it took me back to my younger days as a Peter fan and the joy/awe he brought me, beautiful moment! 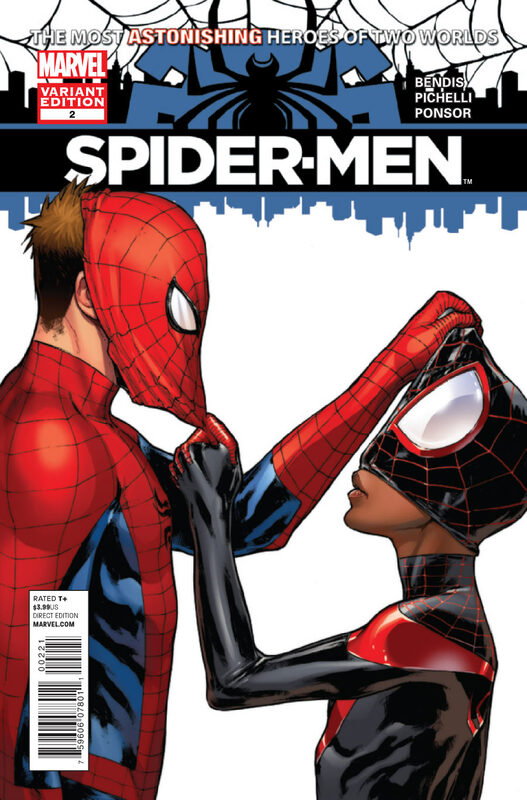 Cover- Miles looks way too old on the cover those unfamiliar will undoubtedly think he’s just a black Peter Parker and thus may not pick up the book.